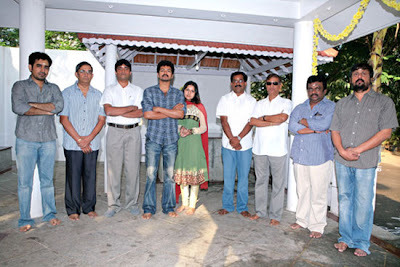 Actor Vijay’s Vettaikaran film Shooting starts. from March 9 2009, The title for this Vijay film has been taken from an old MGR film of the 70’s, and has tremendous recall value. 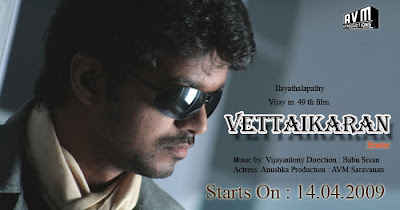 The film produced by AVM Balasubramaniam and his son Gurunath Meiyappan, is Vijay’s 49th film and crucial for the star. All his recent films have been pretty lukewarm at the box-office and he needsa super hit badly. Vijay is pairing up with the glamorous Anushka for the first time in the film, which has music by Vijay Antony. The initial shoot of the film will take place in Rajamundhry in Andhra, which has some of the best village greenery in the south.